There is Paris. There is Tokyo. There is Hong Kong. There is Italy or even Spain. You can debate with me on this. But for me, few places make this food lover’s heart sing (and my stomach growl) like the city of New York. The confluence of vast amounts of wealth, a creative pool of culinary talent, access to a cornucopia of ingredients and a craving for good food has made this city what it is today. A birthplace of delectable gastronomic trends. A magnet for yearning foodies from around the world (including myself). Chef Camapnaro and his Little Owl’s partner, Gabriel Stulman recently opened this charming eatery hoping to create a place that is equal parts restaurant and retail space. With the help of head chef, Mike Prince, Market Table services American comfort food at its best. The restaurant has a industrial loft-like feel to it. Dark walls, exposed high ceilings, large street-side windows, butcher block tables contribute to creating a light and comfortable atmosphere. One could not possible ask for a more ideal brunch venue. After some discussion with our helpful, ever patient server, A and I settled on two dishes. I love Egg Benedict for brunch. And since I’m looking for something familiar, ordering the Poached Eggs with Parma Ham and Braised Spinach was a no-brainer. An oozing amber yolk, lightly salted slice of ham, warm crusty muffin base and topped with decadently smooth, custard-like hollandaise sauce, Market Table’s version was exactly what I needed. From my traditional order to A’s more whimsically delicious one, the Soft Shell Crab Sandwich was a complete surprise. We were expecting a variation on the crispy crab cake but what landed on our table beyond what we could have anticipated–a whole crab in a bun staring back at us. Legs, claws and shell are deep-fried to lovely golden brown, served on bed of lettuce and sliced tomatoes and squeezed into a crusty roll. This sandwich is a handful but once it reaches your mouth–it is crunchy, crab nirvana. The best way to describe it is like biting into a crab-flavored Mentos–light and crisp on the outside, sweet and succulent on the inside. Sunday rolls around. As we struggle to overcome an annoying case of jet lag, A and I meet up with our New York-based friend, W. After quick tour local food markets in and around Union Square (W is writing a paper on organic food retail), we head off to do what Pinoys do when they get together. We eat. 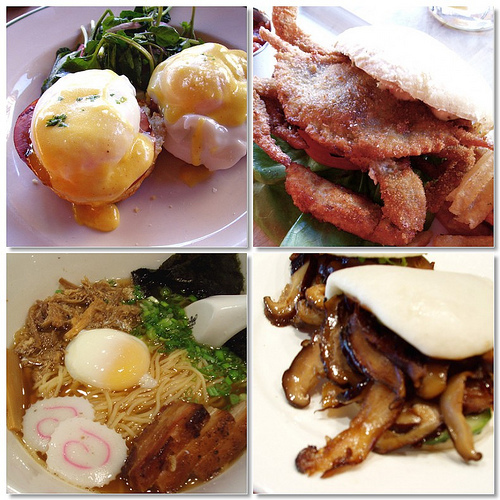 W. recommends we try Momofuku Noodle Bar. One item of my New York to-do list is to visit at least one Chef David Chang restaurant (currently, there are three). After reading so much about this James Beard awardee, I have come to admire Chef Chang. Being the noodle fanatic that I am, it would be sacrilegious if I didn’t dine at one of his restaurants on this trip. I enthusiastically agree. Born out of a stint in a ramen house in Japan and his love for all things pork, Chef Chang created Momofuku Noodle Bar. Relatively small and simply adorned, the restaurant has become quite the culinary phenomenon for noodle-crazed New Yorkers. More often than not, this place is packed. They don’t take reservations and the line sometimes stretches out their front door and down the road. But since we arrive early for the dinner service, we are able snag seats at the ramen bar without much of a fuss. First on the list to taste, the much talked about Steamed Buns. At Momofuku Noodle Bar, they offer three varieties: chicken, shiitake and pork. We settle on the chicken and mushrooms. Each variety prove to have its personal charms. The steamed buns are soft, light and easy to the bite. The pulled dark chicken meat, formed into a patty and fried to a golden-brown exterior, is crunchy, moist and flavorful. A perfect chicken sandwich. On the flipside, the shiitake were sublime. Thin cuts of soft, sauteed shiitakes are coated in fruity, yet slightly spicy sauce and stuffed in airy buns. Subtle in flavor but with just enough sweet-spiciness to keep things interesting. Personally, I enjoyed the Steamed Shiitake Buns more. If you are going to noodle bar, you obviously have to order the noodles. We order two kinds. First, the Momofuku Ramen. A large steaming bowl of pork broth filled nearly to brim with delicious ingredients : thin ramen noodles, slices of succulent pork belly, shredded beef, a soft boiled egg, a generous sprinkling of spring onions and a piece of dried seaweed or nori for some contrast texture. This bowl of ramen is scrumptious and perfect for a cool, fall evening but I can’t say I am completely bowled over by this signature dish. In contrast, I gush delicious over the Bibim Gooksu. Of late, I have been on a cold noodle fix (I’m tired of burnt tongue) so having this traditionally Korean dish was not a difficult decision. Somen noodles, coated in a sweet-spicy kimchi-like dressing, are topped with variety of delectables like slices of cucumber, a light fried egg, fine juliennes of nori and small bars of roasted sesame seeds. Uncomplicated, well-balanced in both flavor and texture and with an intriguing sugary-hot zing, this Bibim Gooksu is straightforward deliciousness in a bowl. My food adventure is only the beginning. There is more to come. i just got a hankering for some papaya king dogs. so good. there are just too many great places to eat in nyc that its both a food lover's boon and bane. never enough time to go around! Just came back from trip to NYC. We were quite lucky to experience dining at Little Owl last August 30. Our group had meatball sliders and risotto with truffle oil for appetizers, crispy chicken and pork chops for our main course and sherbets for dessert. You should really try Little Owl! Other must-tries --La Sirene ( a lovely BYOB french bistro), Socarrat, Tartine and Lupa (good, reasonable food). And btw, shake shack deserves the rep as one of the best burgers in town and worth lining up for. If you want a short wait, try lining up at 11am or mid afternoon. Hi mfb. Thanks for the suggestions. We'll be trekking to the West Village today to try out luck at Little Owl. i love the shitake steamed buns in momofuku. i wasnt so impressed with their ramen. i guess for me, ramen is ramen and i couldnt really differentiate it with the other ramen place like republic. Hi Paul. It can be really frustrating that one doesn't have the time to try everything. :( But we try to enjoy what we can. Hi bernice.Thanks for the suggestion. We'll drop-by and check it out. It is a yummy food.. nakaka homesick..
david chang is brilliant, isn't he? he was on the martha stewart show last week and they made momofuku's pork belly and the white bun that comes with it. everything was so simple, it was ridiculous! try to pass by the French Culinary Institute and get a reservation if you can. Their Prix Fixe menu for lunch and dinner are dirt cheap for the quality of food you'll get.